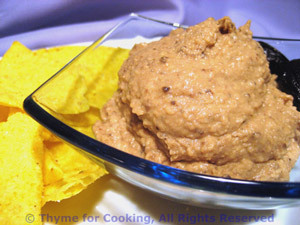 Hummus with Homemade Taco Chips, Thyme for Cooking natural, gourmet snack. Simple: Put everything in a blender and purée. The recipe calls for tahini or sesame seed paste. You can substitute regular creamy peanut butter. You will need to scrape the sides of the blender with a spatula to get it all properly puréed, and pulse a bit. If still having a hard time add a bit more oil, 1 tsp at a time. Put all ingredients in blender and purée until smooth. Serve.